Making the decision to remodel the exterior spaces around your home takes a different type of planning and patience than interior remodels. Added to budget, style and material considerations are a host of unforeseeable's and variables that, if not accounted for, can quickly delay or derail your project. Even before the first shovel goes in the ground, it's important to assess all the aspects of your outdoor project, and to ask some very critical questions. A simple stone walkway helps visitors to this back yard project know they have options for where they can go. 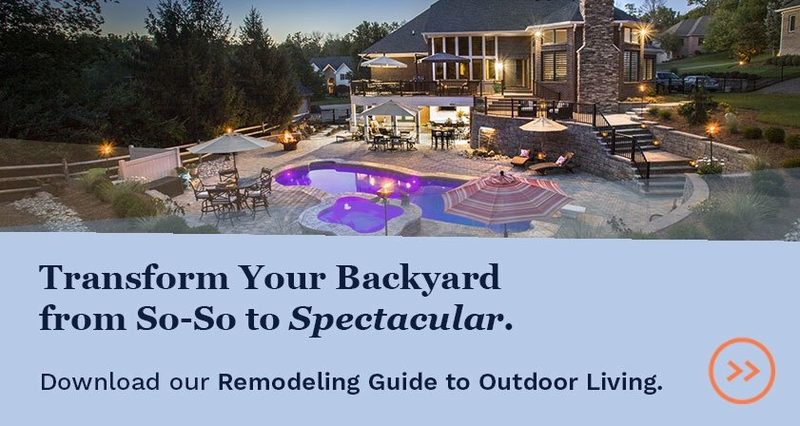 Great remodeling projects, indoors or out, go smoothly when you come into them with a basic list of what you're looking for. 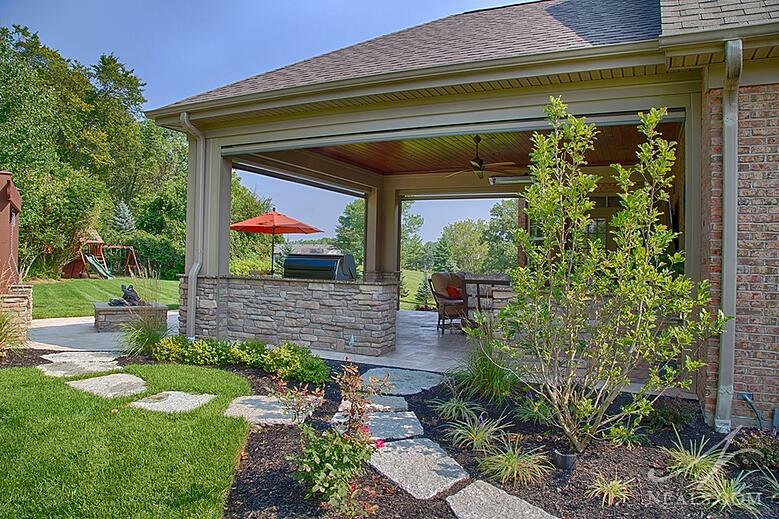 "The first thing we do, even before our initial consultation, is ask the homeowners to create a wish list for their project," says Keven Werbrich of Werbrich's Landscaping. 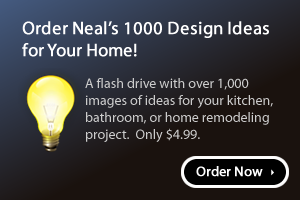 We recommend using online tools, such as an ideabook on Houzz or a board on Pinterest, to collect ideas, images and articles you come across, though a physical folder or binder also works if you prefer. You don't have to know the specifics of your space or where exactly you'll put everything when you start. It's just important to get all the ideas captured. Once you have a good handle on what you'd like to see in your yard, even if you have several overlapping ideas, you'll want to consult with a contractor or landscaper. A professional team will measure your space, and assess what can stay and what should go (such as trees or existing plant beds). More importantly, they will help reconcile your wish list. Many times, homeowners include multiple structures or elements in their wish list, such as a covered patio and a pergola, or a fireplace and a fire pit. Talking through your ideas with a designer and landscaper, and sharing the ways you envision using your yard will help shift out pie-in-the-sky ideas from those that will actually fulfill your needs and desires. Several wish list items were collected in this pavilion to reduce the impact on the surrounding landscape. Is the Yard for You or For a Crowd? Outdoor living spaces designed for use by a family are different in nature from those intended to accommodate large groups. 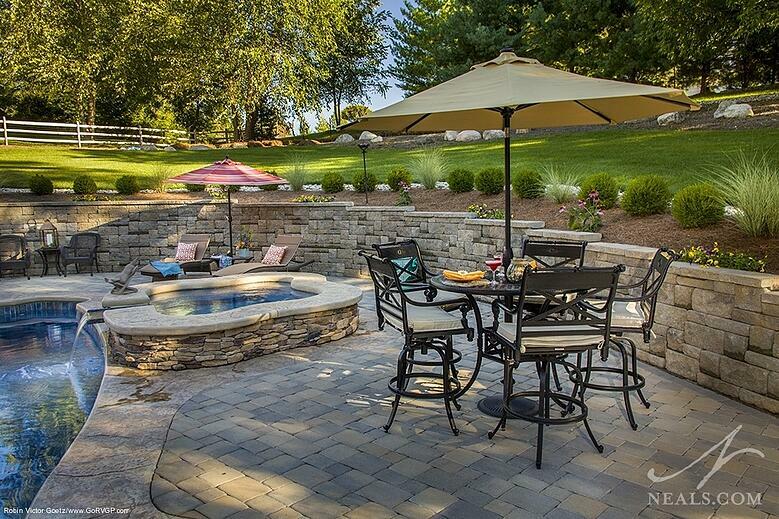 Consider your needs for exterior entertainment space when evaluating your wish list and budget. When you have a group of 10 or more people, the ways in which you use a space change, and crowding and bottlenecks are more likely to occur if you haven't accounted for that. Even outside, landscaped structures can inhibit movement by limiting space for guests, or even by making guests feel constrained since there are fewer open spaces for them to go. If you host groups, but also need a space that meets the needs of your family, you'll need to look for ways to re-purpose spaces so that you feel just as comfortable when you are enjoying a drink and a good book alone as you are surrounded by friends and family for a grill out. 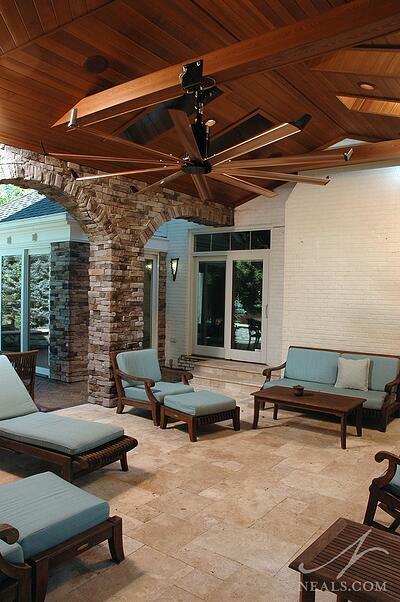 Furniture in this large stone structure can be easily moved around to make room for a crowd. Many ideas you may have might be impossible to achieve without major excavations to re-grade your property, or significant structural modifications to account for slopes that can't be altered. This is one area in which budget and wish list often collide, since any changes to the shape or format of your yard need to be handled before any structures can be built. "In extreme cases," says Werbrich, "half the project cost can be making the site level in order to fit everything on the wish list." A long retaining wall holds the hillside back from this excavated area, where a large patio now welcomes guests. Finding the right balance between your needs and wants, and their cost can be tricky. 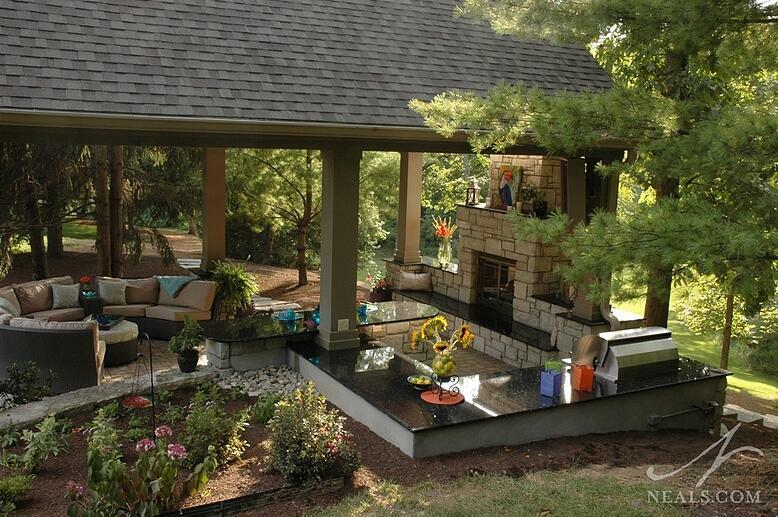 In many cases, your landscaper or designer can provide alternative solutions to get the price tag under control. For example, they may suggest a pergola instead of a pavilion, or ask you to weigh the pros and cons of a fireplace versus a fire pit and make a choice. Another option that is often easier to accomplish outside than with interior remodels is to break your project up into phases. Excavations and patios can be completed in the first phase, while structures come in the second phase with final landscaping. The primary goal is to achieve what you need in your yard in order to make it a space you will love to use, so be prepared to vet the wish list and look for compromises when the budget pushes back. 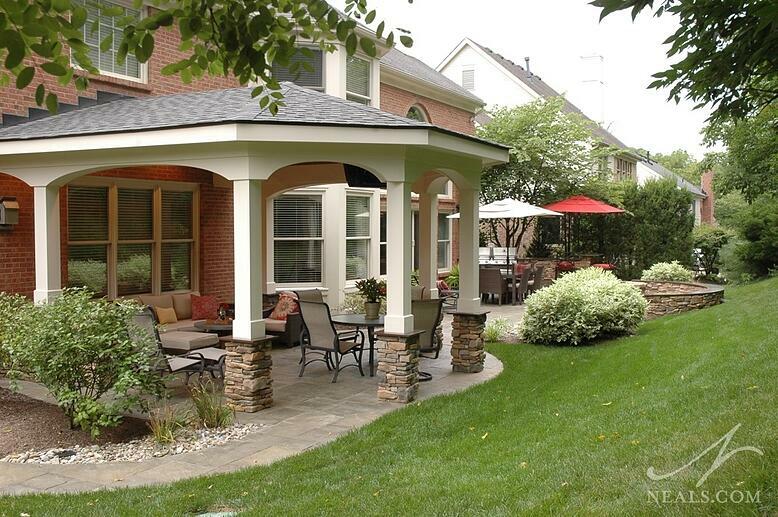 In this two-part project, the patio came first, while the covering structure came later. The underground structural elements needed for the structure were accounted for in the first phase. One of the biggest pitfalls of outdoor renovations is not taking the time to consider the variable you can't see. The biggest of these, for nearly every type of project, is drainage. "It's never on the wish list," states Werbrich. It's certainly not the first item on your list, but it is undoubtedly the most important. Drainage needs to be carefully planned to avoid puddles in the middle of your new patio, or rivers along your walkways. The easiest solutions are surface drains or catch basins, while more involved drainage needs may require new or re-routed gutters and downspouts on your home, or underground drainage piping that moves ground water away from your new outdoor living areas. Make sure to talk with your landscaper about drainage early on, to ensure that it's accounted for in your budget. 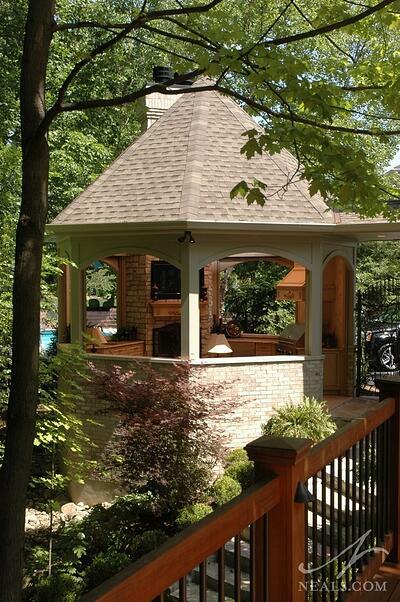 The fireplace wall in this gazebo was positioned to block some of the view into the yard from the neighbor's. It's also a good idea to spend time during your planning stage observing where the sun hits your yard throughout the day (and over the course of the year) to avoid positioning elements in a way that a bright sunny day makes them impossible to enjoy. Also pay attention to whether there is a view you want to maintain from inside the house. Structures that you add to the back of your home will affect light through nearby windows. Privacy is also an important factor to yard transformations. If you will be adding elements to your yard that neighbors may want to peek in on, you may need to increase plantings or fences, or position new structures to block views into areas you would like to be more concealed. You can follow Werbrich's Landscaping on Facebook or Houzz.